Nothing is more refreshing at a hot summers day than a light lunch with a young and zesty wine, right? We did just that the other day. 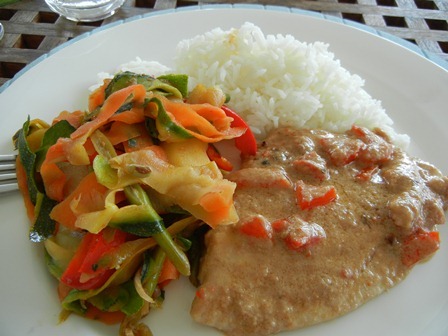 The food consisted of a white fish (snapper in our case) in a spicy sauce, mixed vegetables and steamed rice. Asian food can be paired with a variety of different wines. 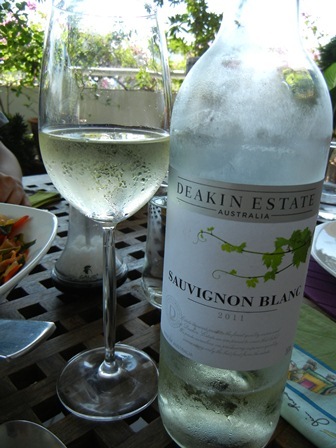 My choice of the day was a ‘2011 Sauvignon Blanc’ by Deakin Estate, Australia. This is “value for money” wine here in Thailand, “pedestrian” so to say but solid and exactly what one would expect from a young and fresh Australian Sauvignon Blanc. Therefore I recommend it. As you can see from the two pictures above and below, the newest vintage of the flagship wine of Gran Monte Family Estate, had no label as yet when I tasted this wine a few days ago. 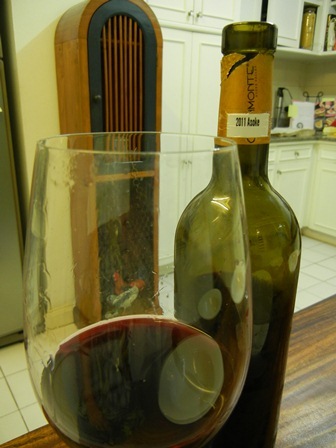 The 2011 Asoke, a blend of about 60% Cabernet Sauvignon and 40% Syrah, is a ripper of a wine, maybe the best red, Thailand’s vineyards have to offer. The previous vintage, the ‘2009 Asoke’ has won many medals, two gold, three silver and three bronze medals, at international wine shows in Europe and in Asia. 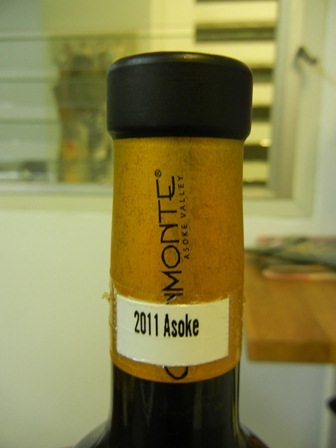 The 2011 vintage of the Asoke has so far won a bronze medal, but I am confident that this young wine has a great potential and will win more awards when it has settled and aged a little. It has lots of dark fruit flavour, blackberry to me. The tannins are still a bit astringent but will mellow with time. As the previous vintage, I guess it has spent some time in new oak. It is a very pleasant wine, strong and powerful, the best red I had in a long time. The wine-maker is Nikki Lohitnavy, the young and talented and already well known vintner of Gran Monte Estate. Nikki is getting better every vintage. In a few years time her wines will be collectors items, I guess. We had the wine with a meal, of course. It was not red meat with which this wine would harmonize Extremely well. 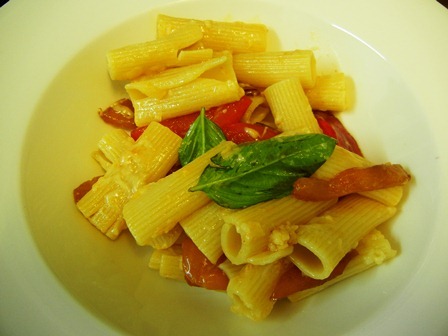 Instead it was a pasta cooked by my daugther Charlotte (our resident cook, my wife Margit, is absent for a while). She is a very good apprentice, and the pasta was superb. Needless to say that this simple meal with the excellent wine from Gran Monte, made a wonderful father and daughter event. My suggestion to wine lovers in Thailand: secure a couple of bottles of this wine, put them down in a good wine fridge, and enjoy one after the other with or without food, at special and ordinary occasions, and when you want to show off. This is the thing. The upcoming harvest festival at Gran Monte Estate, on February 2 and 3, will give you a unique opportunity to learn more about Gran Monte wines, the vineyards and the wine-maker. You should book now and/or visit Khao Yai at your own pleasure. It is worth it. PS: While writing this on my terrace, I am drinking another one of the great Gran Monte wines, the 2012 Viognier, a beauty of a single vineyard, single variety wine. I am always happy when I find essays and articles about wine and wineries in newspapers and magazines. So it was with the above piece, published on January 11, 2013 in the Bangkok Post. 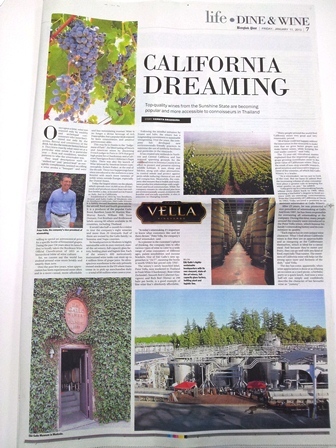 “California Dreaming” is mainly about wine-maker Peter Vella and the wine empire of the Gallo family in California. The author of this article tries to address the “angst” of people who are new to wine and wine drinking and first-time wine consumers. Fortunately, wine was never the drink of an elite only. This is only so in Thailand because the high taxes on imported and domestically produced wines which are taking wine out of the reach of the common person. Fortunately, I come from a different tradition. In the Mosel valley where I grew up, it was the simple people, the famous “man on the street”, the villagers, the workers, who were wine drinkers and many of them are experts as far as the quality of the heavenly fermented juice is concerned. Further down on the page some wines made by Peter Vella are mentioned. These wines are now available in Thailand it seems. Vella offers among others a “Fresh White” (Chardonnay), a “Smooth Red” (Cabernet Sauvignon) and a “Rich Red” (Shiraz). The retail price of these wines in Bangkok is 299 Thai Bath only, the equivalent of about 7.5 Euro per bottle. Don’t forget there is almost 400% taxes on these liquids. For this in a Thai context modest price, I would get a solid, hand-made (artisan) Riesling in my native land. Instead, what will I get for my 299 Bath? An industrial product of a mass produced grape by a giant winery in California. When considering the level of wine prices in Thailand, tears are dropping from my eyes. We need to be happy that we do get wine at all. And that the variety and choice of wines in Bangkok wine shops and wine bars has improved over the almost 5 years that I live in the City of Angels. How about the wines produced in Thailand? Thailand has a small but vibrant wine industry. There are about 10 grape and wine-making ventures, some of them boutique family vineyards, others medium to large sized wineries. They have to strive for the premium segment of the market, not the mass-produced base-wines as the ones mentioned above. I highly recommend you try some of the indigenous products the next time you order a bottle of wine in Thailand. The other day (actually it was about a month ago during my last visit in Trier, Mosel), I had some fabulous reds at “Weinsinnig”, my favourite wine bar in Trier. Both wines come from the Pfalz (Palatinate) wine region in Germany. Markus Schneider Estate is located in Ellerstadt, and Rings Estate in Freinsheim. Both estates are led by young and innovative vintners and wine-makers. 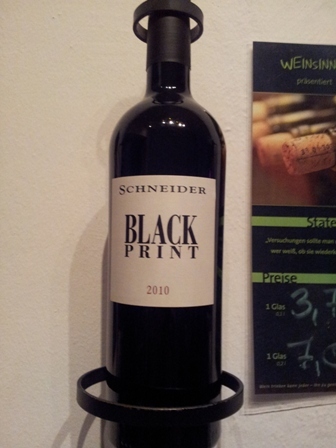 I have written about the wines of Markus Schneider before. ‘Schneider Ursprung’ is a wonderful cuveé (blend) of Cabernet Sauvignon, Merlot and Portugieser. The ‘2010 Black Print’ is a blend of St. Laurent, Merlot, Syrah, Cabernet Sauvignon, Cabernet Mitos and Cabernet Dorsa (hold your breath). The last two grape varieties are new crossings (hybrids) produced in Germany. The wine was matured in small oak barrels. It has an almost black colour, as the name suggests. The fruit aromas are very concentrated, some plum and cassis but also blackberry. The tannins are already soft enough and well balanced. This is a yummy wine at a very reasonable price (around 12 Euro/bottle). But you have to be quick to pick up the remaining bottles. Markus Schneider is not only very innovative as the composition of his blends are concerned but also the labelling of his wines is new and against German traditions. The Wine Guy has done a portrait of the winery which might be of interest to you. Also the second wine I tasted at Weinsinnig was a red cuveé from the Pfalz. 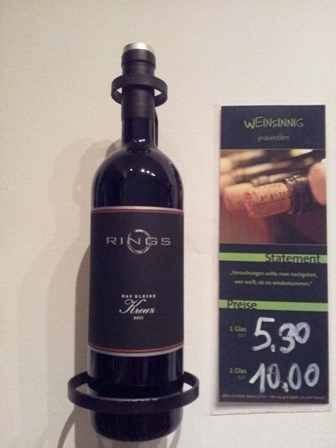 The ‘2011 Das kleine Kreuz’ by Rings Estate is a blend of Merlot, St. Laurent, Cabernet Franc, and Cabernet Sauvignon. The brothers Andreas and Steffen Rings appeared 2007 on the German wine scene. That was the year that the Gault & Millau wine guide included the winery for the first time. Last year the brothers won the German red wine award. This wine is just wonderful, awesome, fabulous. The density of the fruit, the well balanced acidity, the soft tannins and the long finish are all very striking. I could not believe it, my vintners soul cried more, more, more. If we only could have these wines in Bangkok. The question, what wine to drink with this meal, I answer with a counter question: have you tried a rosé from Thailand? Have you heard about Gran Monte Sakuna rosé? If not, then it is high time that you familiarize yourself with new latitude wines in general and Thai grape wines in particular. This wine, made by wine-maker Nikki Lohitnavy of Gran Monte Estate, has the most amazing colour, you can imagine. Lollypop, lollies and bonbons come to mind. The colour entices you to learn more about this wine. It is made of 100% Syrah grapes, strictly following traditional rosé-making methods and rules. The strawberry aromas are fresh and crisp. This off-dry wine and it’s discreet and subtle sweetness are the perfect accompaniment to a hot and spicy dish, either of a Thai or a non-Thai descent. We had the above spicy seafood pasta for lunch, and it turned out that the selected wine was a perfect match. This young wine, which was already awarded a silver and a bronze medal at international wine shows, is the just perfect for hot days and with spicy food. PS: The new Gran Monte wine collection of the 2012 vintage will be released soon. You are currently browsing the The Man from Mosel River blog archives for January, 2013.